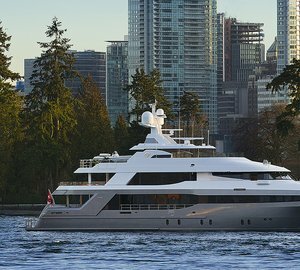 BOXER is a 34.14m (112') luxury motor yacht built by the American shipyard Westport and launched in 2010. She was refitted in 2017. She has an attentive and professional crew of five. 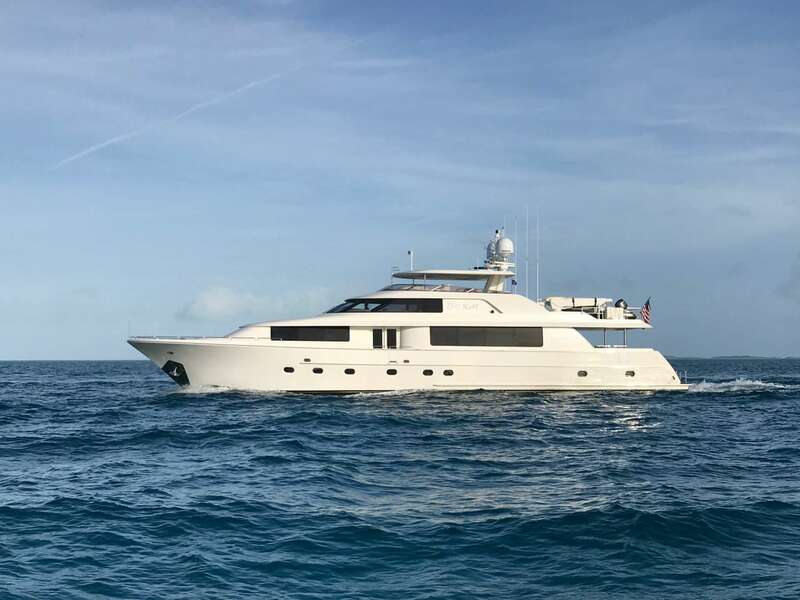 Designed as a modern motor yacht, she has excellent onboard entertainment facilities and optimal space usage, which includes a flybridge Jacuzzi and a forward galley that can be used for meals and as a third interior salon. 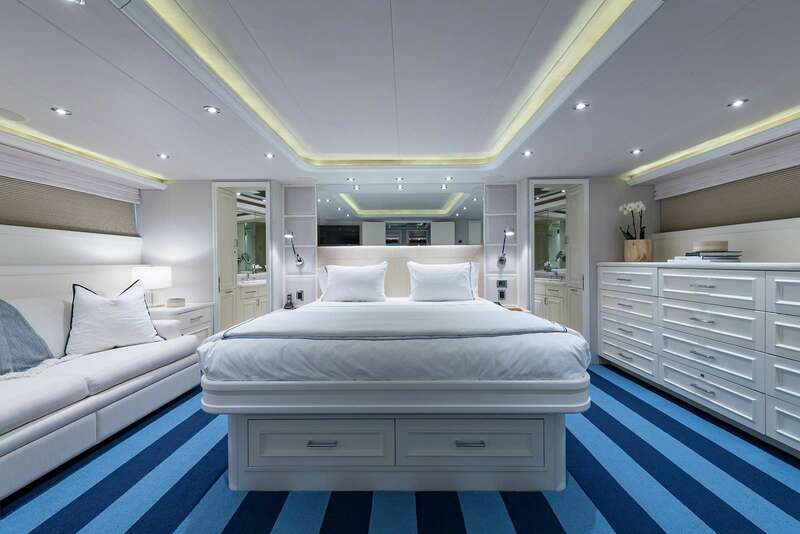 The naval architecture is the work of Jack Sarin with contemporary interior design by Marty Lowe that uses white panelling, pale flooring and warm floor and ceiling lighting. The traditional navy blue can be found as an accent in the main salon and cabins to contract with the cool white furnishings. The accommodation sleeps a maximum of eight guests and a crew of five for professional service throughout the journey. 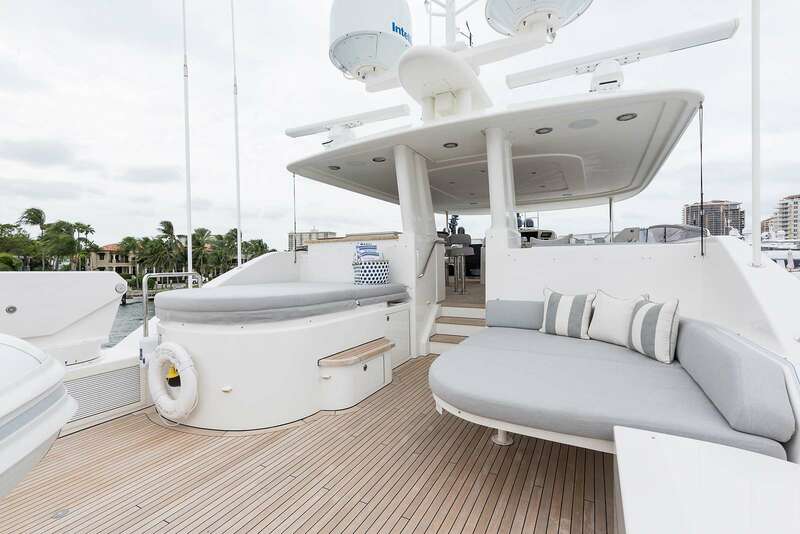 Two staircases lead up to the main deck aft, where there is a plush sofa lining the stern and a raised table for alfresco dining. 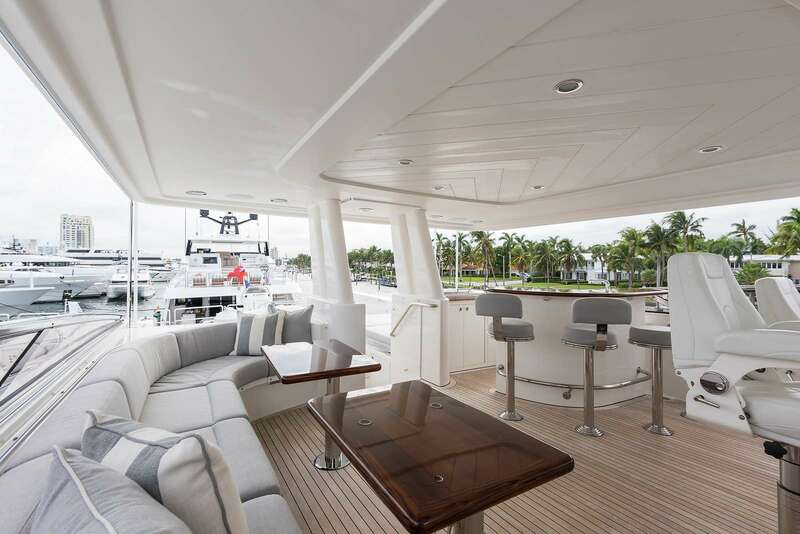 A wet bar is placed forward to port for refreshments day or night, and adjacent there are armchairs and a stairway up to the flybridge. 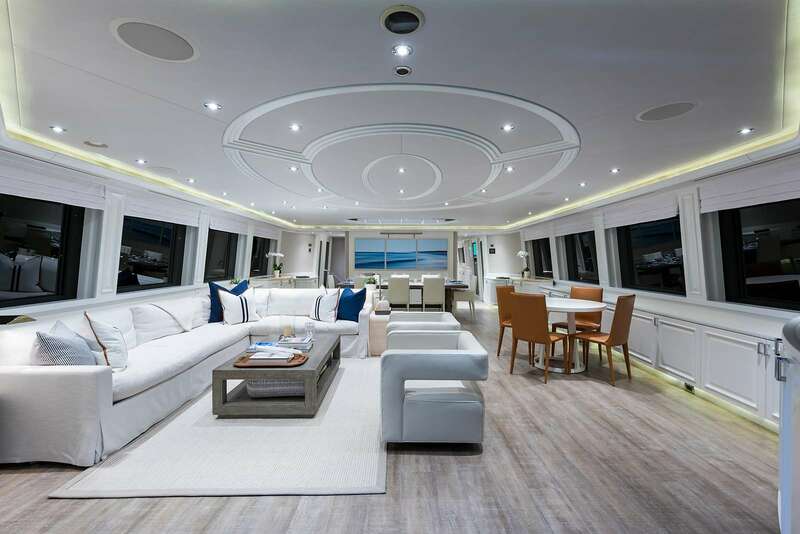 On the foredeck, there is a curving sofa where the group can gather for cosy drinks with uninterrupted views. 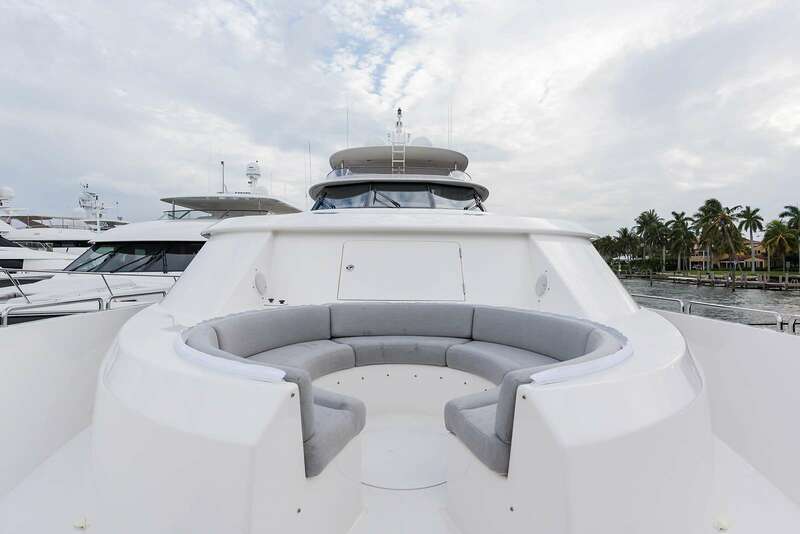 The flybridge is the main alfresco socialising area on board and comes fitted with an amidships Jacuzzi to port that can be covered when not in use to become a sunbed, with a sofa/sunbed opposite. 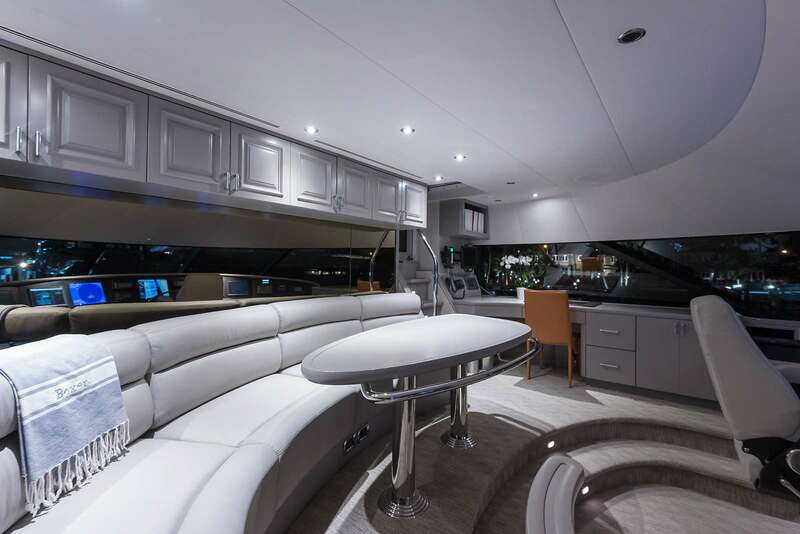 There is a wet bar forward beneath the hardtop shade and a curved sofa and two drinks tables are located adjacent with the Captain's chair, co-pilot seat and helm control forward. The tender and motorised water toys are stored at the stern and are launched and retrieved safely using a Davit crane. 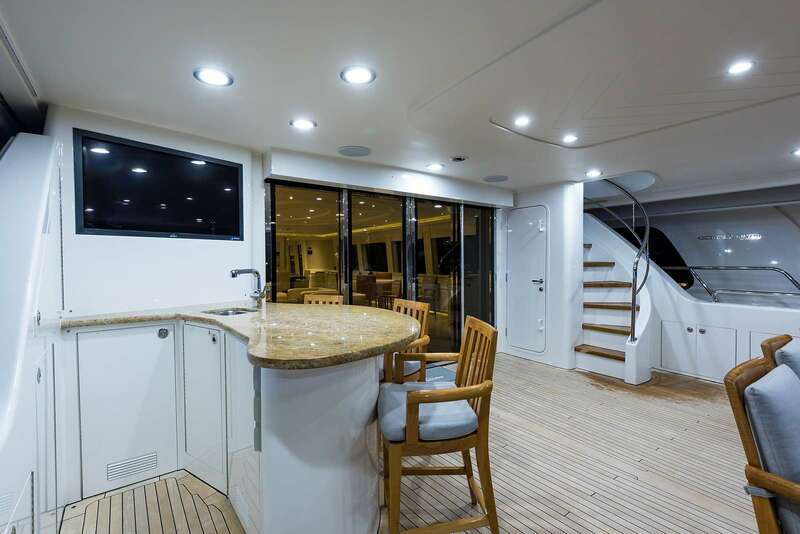 The lower deck hosts the guest accommodation forward and amidships, with the engine aft of amidships and the crew accommodation, including Captain's cabin, placed within the stern. 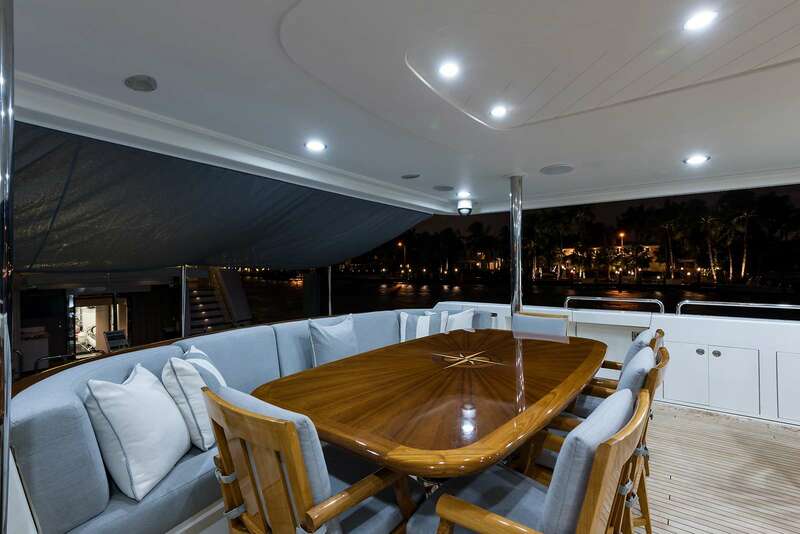 On the main deck, there is a forward galley with an island counter and a dinette consisting of a curving sofa and chairs laced around a large elevated table. 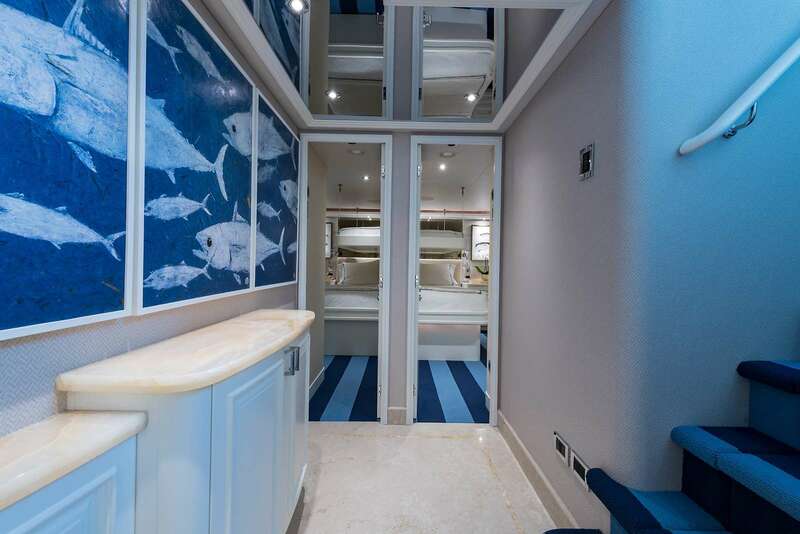 The laundry and pantry are placed aft to port of the galley with the main foyer opposite. 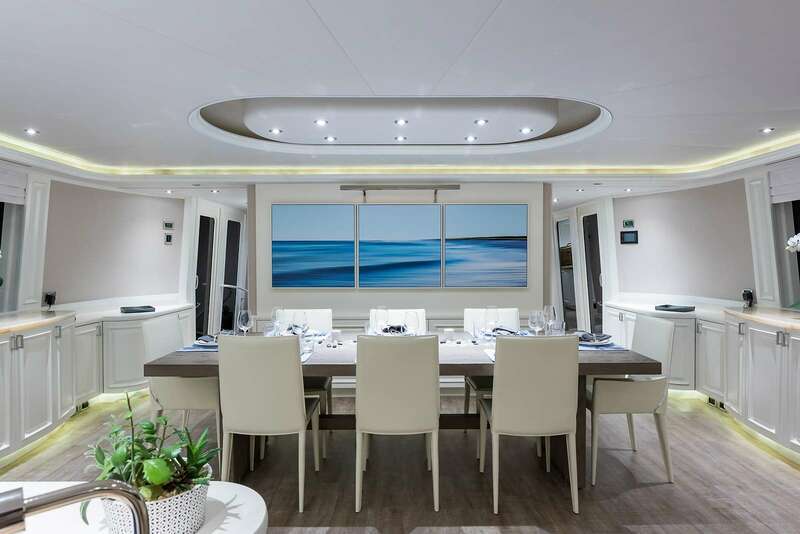 Behind, the formal dining area is placed forward and seats up to eight guests in elegant surroundings, with a drinks/games table behind to starboard and a port seating area with an L-shaped sofa, two armchairs and a coffee table. 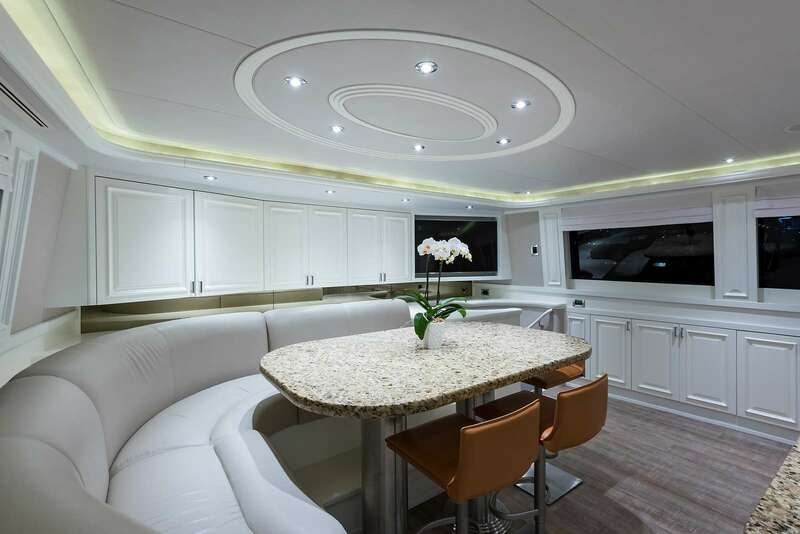 Within the raised pilothouse there is an additional lounge, that has a port-side desk and a curved sofa integrated along the aft starboard corner with a table for casual indoor meals and time spent on hobbies. Twin MTU 16V2000 M91 engines produce a top speed of 24 knots, a cruising speed of 21 knots and a range of 5,500 nautical miles. 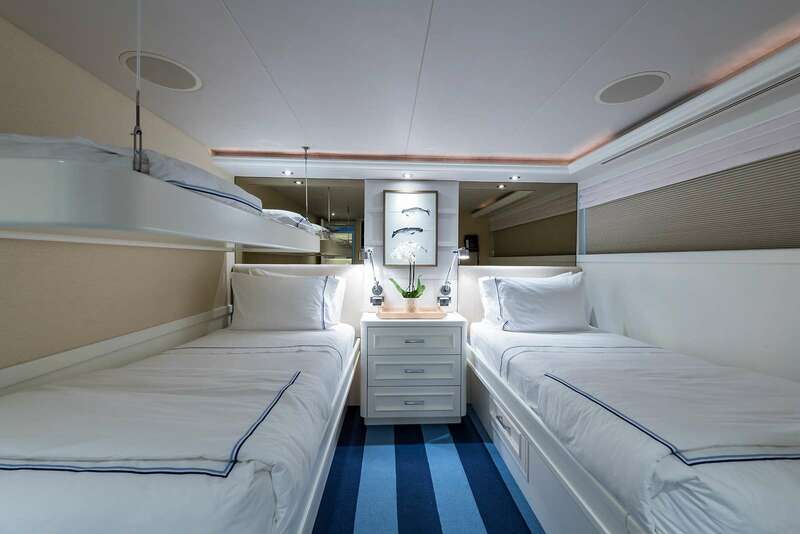 The accommodation sleeps a maximum of 8 guests over 4 en-suite cabins: 1 Master suite, 1 VIP stateroom and 2 twin cabins, both with a Pullman berth. 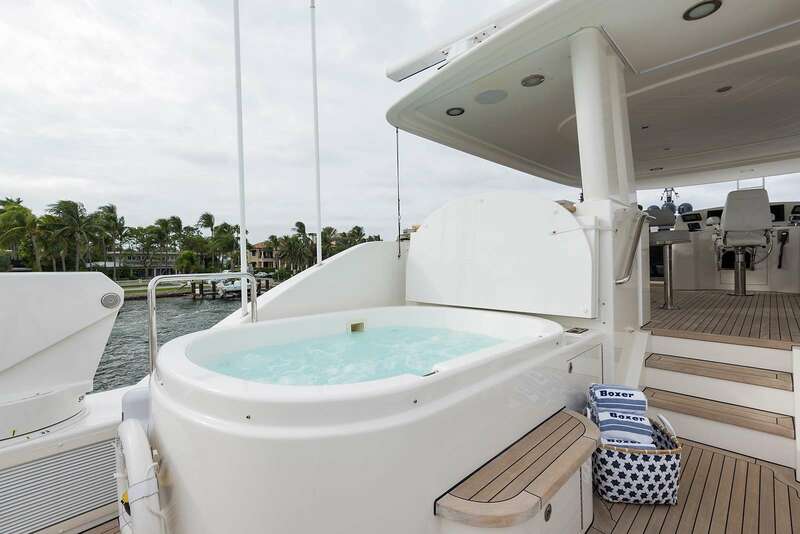 ~ The Master suite is forward of amidships and is fitted with a king-sized bed and dresser, a port-side sofa and a walk-in wardrobe, a personal safe, large flat screen TB with Blu Ray player and a Creston wireless remote. 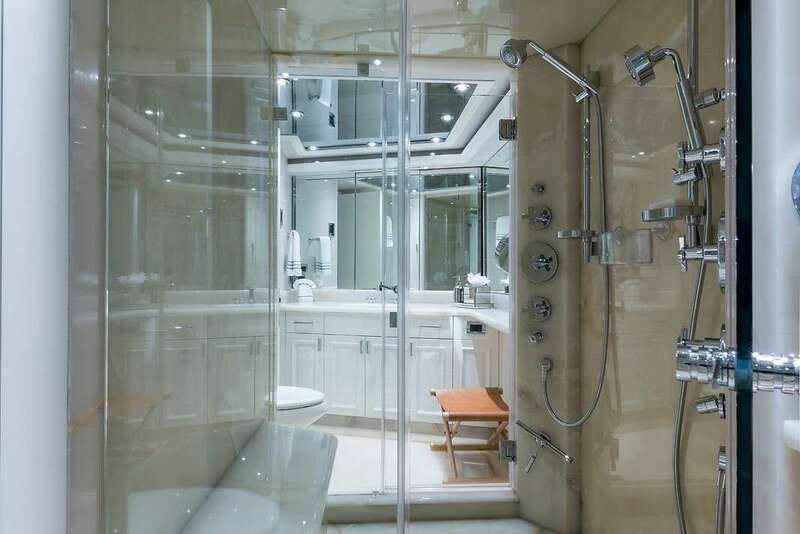 The en-suite bathroom has two separate entrances and both have a sink and toilet with an onyx-encased shower in the centre. 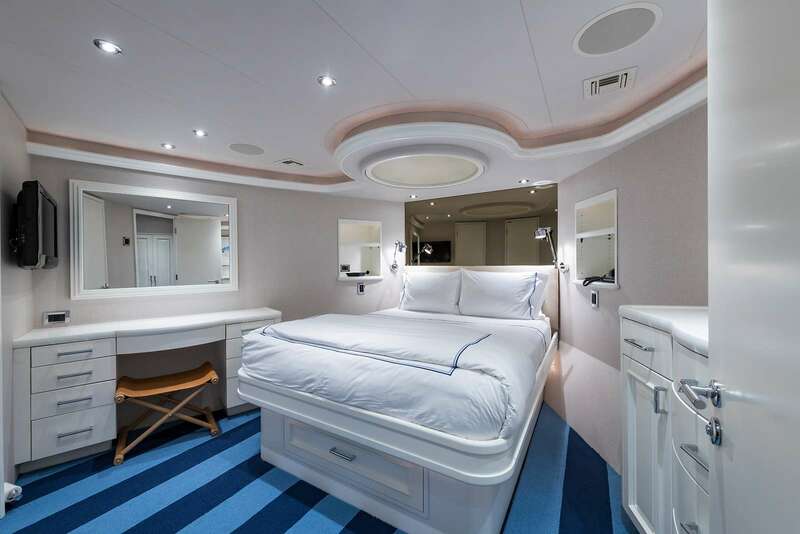 ~ The VIP stateroom is placed forward and is accessed privately through the main deck forward galley. 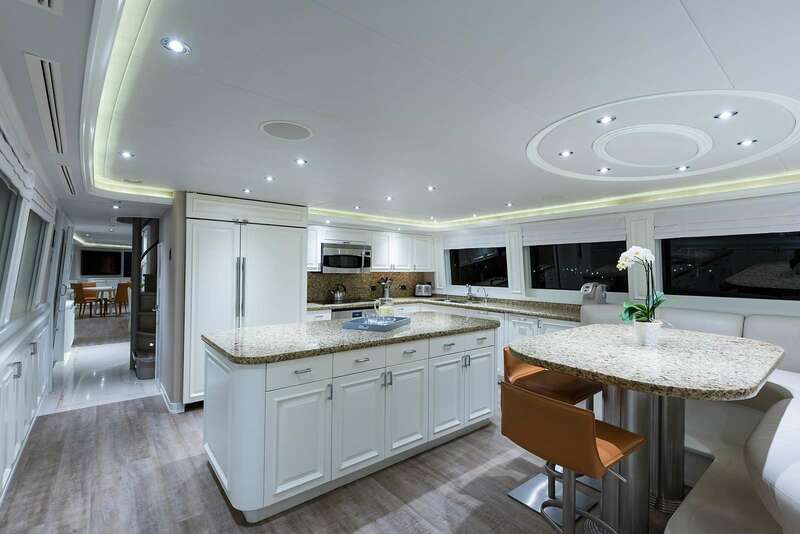 The interior is furnished with a queen-sized bed, a chest of drawers and a walk-in wardrobe, a personal safe, a 27' LG Flat Screen TV and overhead speakers with Creston wireless remote control interfaced with the Direct TV system. The en-suite bathroom has a toilet, sink and shower. 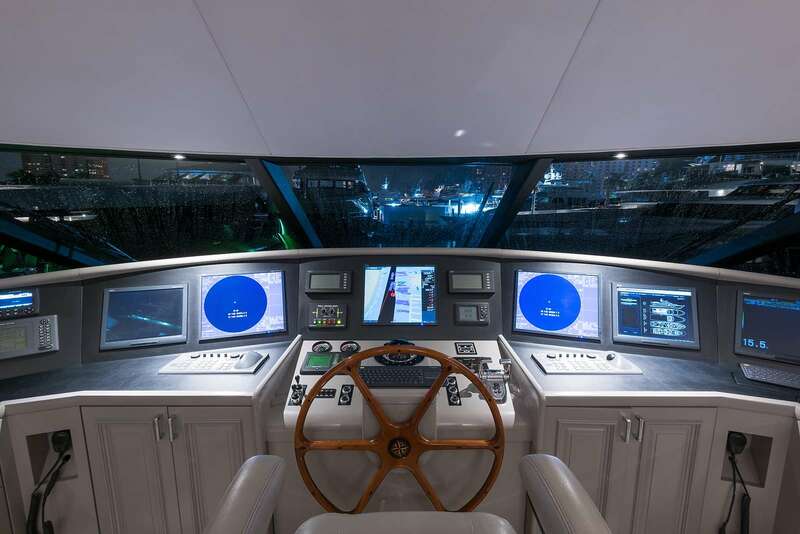 ~ The twin cabins are placed to port and starboard behind the central staircase. Both cabins have twin beds plus a Pullman berth and cedar-lined wardrobes. There is a flatscreen TV with Blu-Ray and a Creston wireless remote. 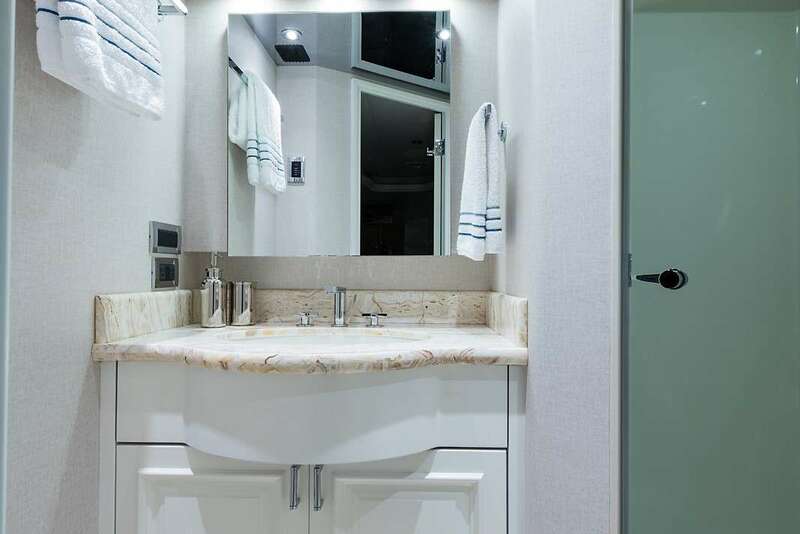 Both en-suite bathrooms have a toilet, sink and shower. ~ The professional crew of 5 will take care of every guest on board throughout the cruise.